Newcomer Alice Levine and recent Radio 1 signing Phil Taggart have been given a new show on the station. The pair will champion new music, presenting a show from 10pm until midnight on Mondays to Thursdays. The slot was formerly hosted by Nick Grimshaw before he took over the Radio 1 breakfast show earlier this year. Levine describes her new role as a "dream come true" and says she "can't wait to get started". Her new co-host says that he has "been a total Radio 1 geek" for as long as he can remember. "It's a total privilege to be given two hours, four days a week to play brand new music that I am really passionate about and the fact I am doing it with Alice is a complete dream job," added Phil Taggart. "She's sharper than a safety pin and genuinely funny." Annie Mac will also host a new solo show on Sundays, from 10pm to midnight, and will feature "mellow and feel good tunes". That is in addition to her current role presenting the Friday night 7pm to 9pm show featuring drum and bass, house and disco. The DJ, who has been with the station since 2004, says she is "really happy to be given the job of gatekeeper to the weekend on Radio 1". Ben Cooper, controller of Radio 1, says he is pleased with the new slots. "Signing Alice and Phil to the 10pm-midnight show and confirming Annie as the new host of late Sunday evenings rounds off an incredible year for Radio 1 - from Jay-Z and Rihanna on stage at Hackney to launching a brand new breakfast show with Nick Grimshaw. "With Phil, Alice and Annie we have a great set of talented DJs who will continue to champion the best in new music." There is still no official word on the future of Chris Moyles at Radio 1 after he left the breakfast show in September. The DJ signed a contract to stay at the station until 2014 in July last year. A spokesman said there would be further talks with the 38-year-old in January. Communications manager Rick Behari said: "We will be meeting with Chris in January to discuss possible future projects with him on Radio 1." 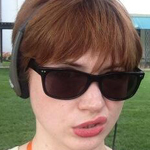 Phil Taggart and Alice Levine's new show will start on Monday 7 January 2013. Bit annoyed Moyles isn't getting this slot now but yeah, thought I'd post it anyway. Last edited by Jack_; 05-12-2012 at 08:12 PM. Last edited by Roy Mars III; 05-12-2012 at 08:24 PM. I love Alice, 2nd best thing about C5 BB. We would have beautiful children. This is a bit silly, Alice is one of those presenters that you need to see as well as hear. She probably won't be at the launch or final now but she'll definitely be doing the week day shows, this gig was given to her last minute after Chris Moyles turned it down a few weeks ago. Last edited by DigitalSid; 08-12-2012 at 05:17 PM. She's covering Huw Stephens on her own from 1 till 4 this afternoon. Foot firmly in the door I see. Gonna give her a listen to see what she's like quite weird her being on though. Hope she doesn't leave bots. I dread to think who her replacement would be. Last edited by DigitalSid; 03-02-2013 at 02:02 PM. I'm sorry but that sting at the end of the clip was better than the 'interview'.